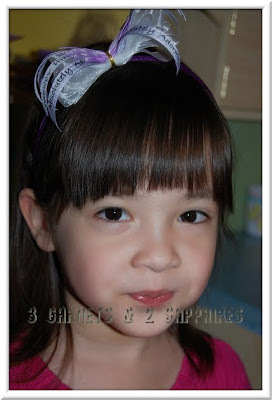 I have always spent lots of money buying bows and hair clips for my daughter from online boutiques since she was an infant. I am pretty much just kicking myself that I did not know about the Mini Bowdabra and the Bowdabra Hair Bow Tool sooner. 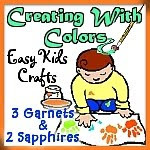 Since my daughter is under 4 years old, I did not do this project with her, but you can certainly make this into a fun activity for you and your grade school-aged child. Since this project has so many possibilities, you do not need to use the same materials I show in my examples below. 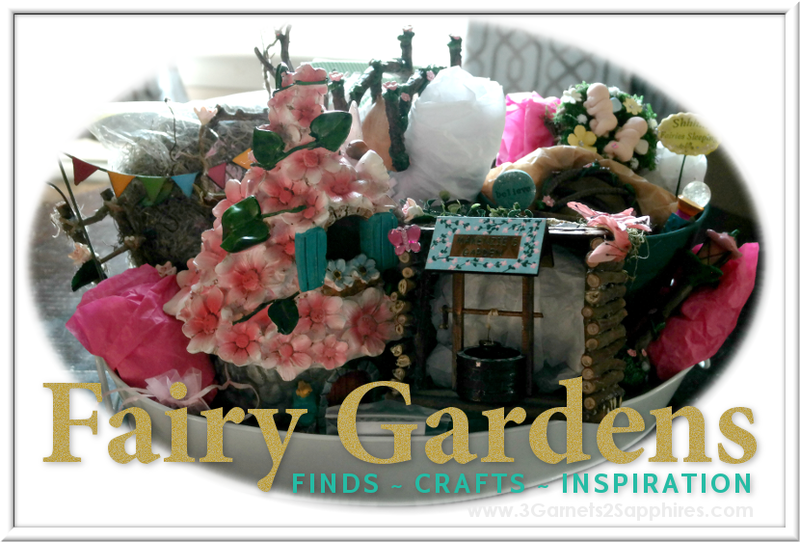 You can use any type and size of ribbon that will fit in the Mini Bowdabra, as well as tulle, stems of artificial flowers, and more. 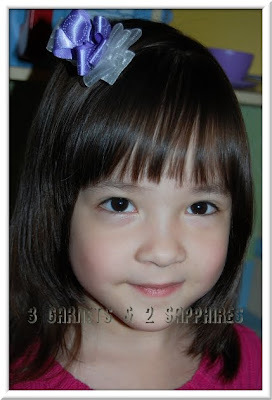 You can use these basic concepts to create hair clips, headbands, and ponytail holders. Ask you child to create a bow hair clip that she would love to wear with her favorite outfit. Step 1. Cut a piece of bow wire approximately 16" long. Fold the wire in half. 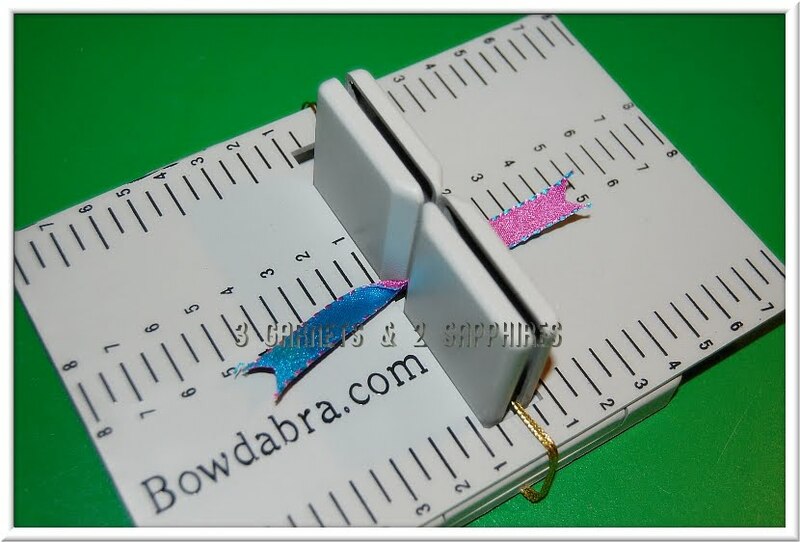 Then slide the wire into the Mini Bowdabra's slot and then wrap/tuck the ends around and under the Bowdabra. Step 2. 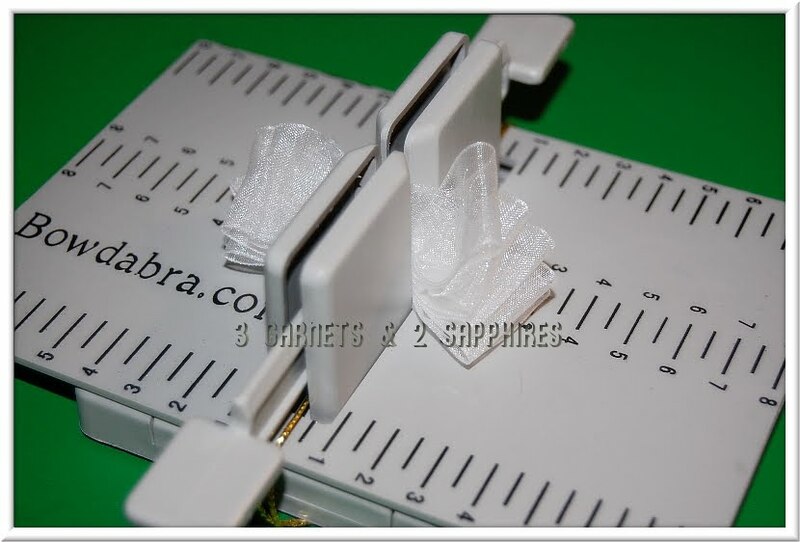 Take the solid sheer ribbon and fold it back and forth in the Mini Bowdabra. The size of the loops and the number of loops is up to you. Use the Bowdabra Wand to scrunch down the sheer ribbon at the center. Tip #1: For best results, make sure you have the same number of loops on both the left and right sides of your bow. Step 3. 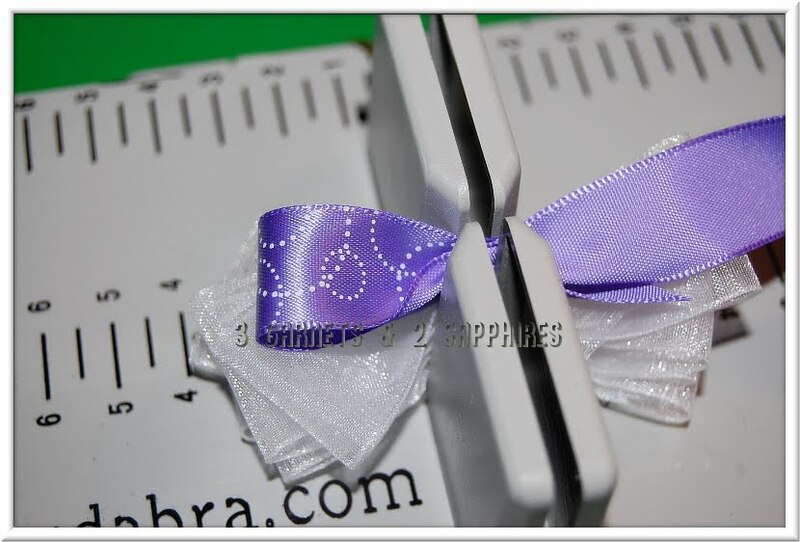 Take the printed ribbon and place it into the Mini Bowdabra print side down. Create loops that are shorter with this ribbon so that you can see the sheer ribbon loops underneath. 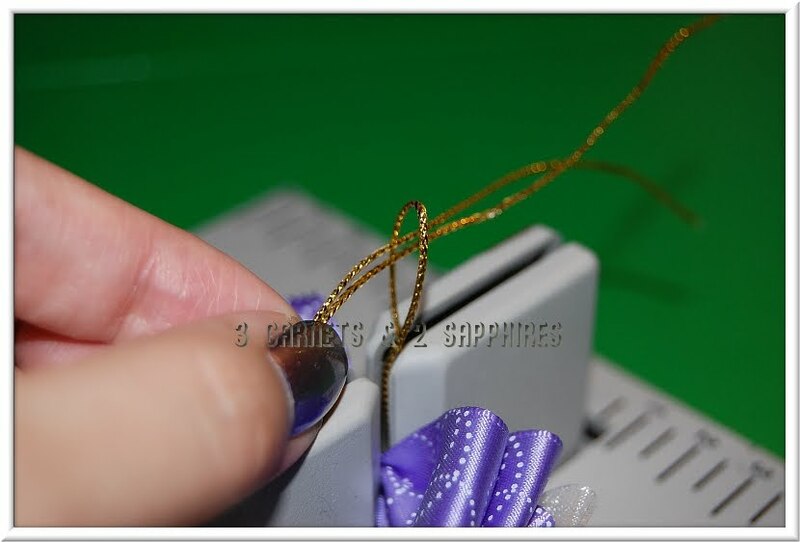 Twist the printed ribbon in the center (as shown above) for each loop you make. 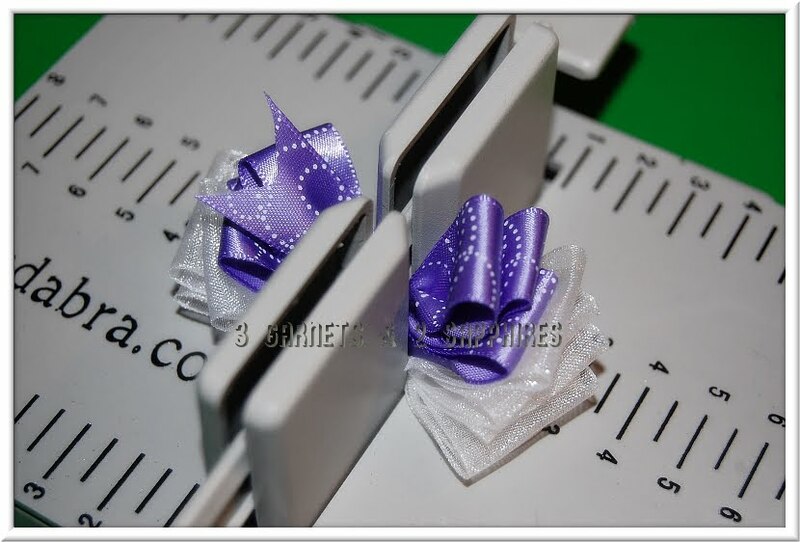 This ensures that the bow is more 3-dimensional and that the print is always on the outside (if your ribbon is only printed on one side). 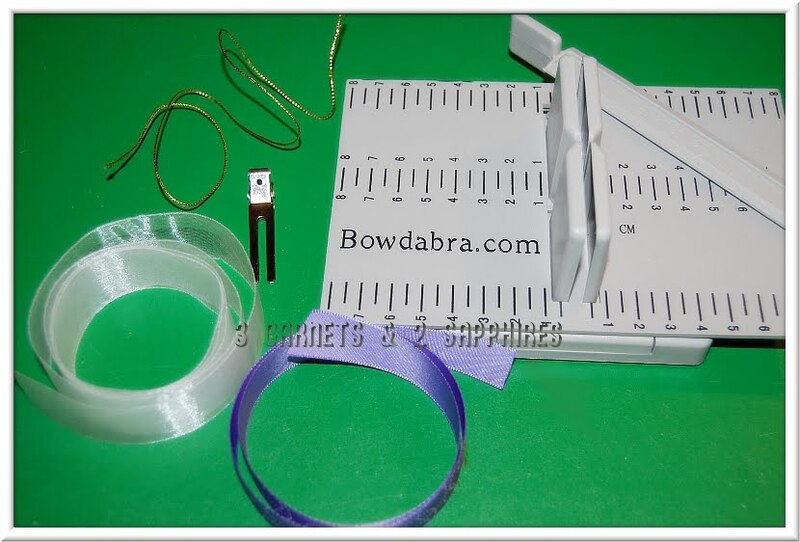 Use the Bowdabra Wand to scrunch down the printed ribbon at the center. Step 4. 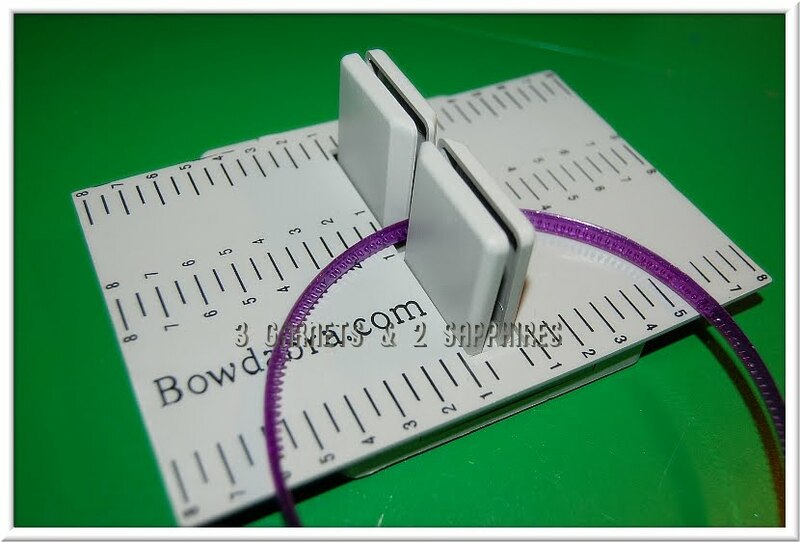 Pick up the two ends of the bow wire. 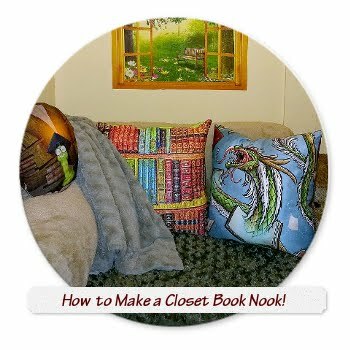 You should have one side with two cut ends and another side that is a loop. Pull the two cut ends through the loop and continue to pull until the ribbon bow is securely cinched at the center by the bow wire. Step 5. Remove the bow from the Mini Bowdabra. Then separate the two cut ends of the bow wire and bring them both around to the back of the bow. Then tie it twice to double knot the wire. Step 6. Slide the metal alligator clip through the tied off bow wire at the back of the bow. Tip #2: For smaller bows, I found that it is difficult to use a 2-prong alligator clip. 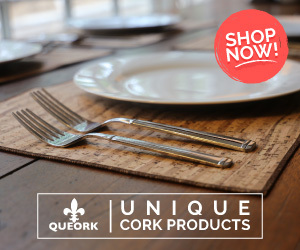 It would be much easier to insert a smaller single-prong clip. Step 7. Fluff and shape the loops of your bow. Here is the result of our project . . .
Below are some alternative projects utilizing the same principles as above . . . 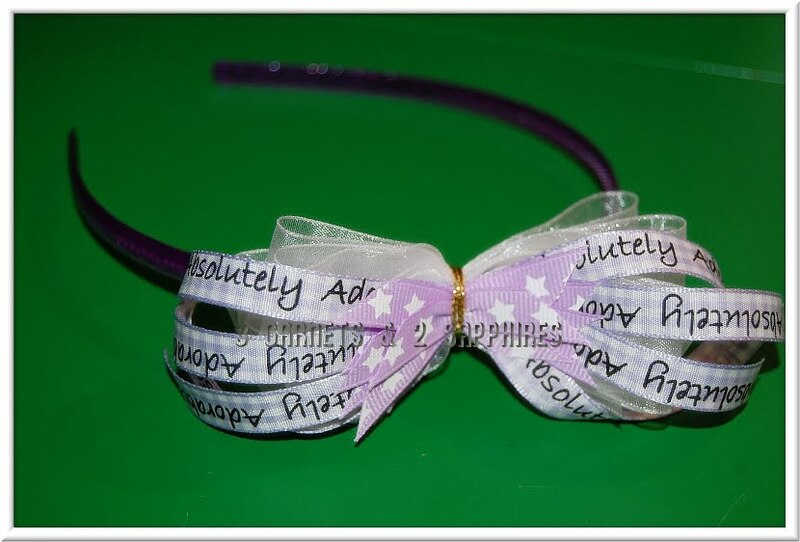 The project below uses a double-sided 3/8" satin ribbon that is a different color on each side. I cut 8 pieces of ribbon all the same length and dovetailed all the ends. Then I placed them in the Mini Bowdabra with a twist at the center, after inserting my folded bow wire, making sure to alternate the colors. 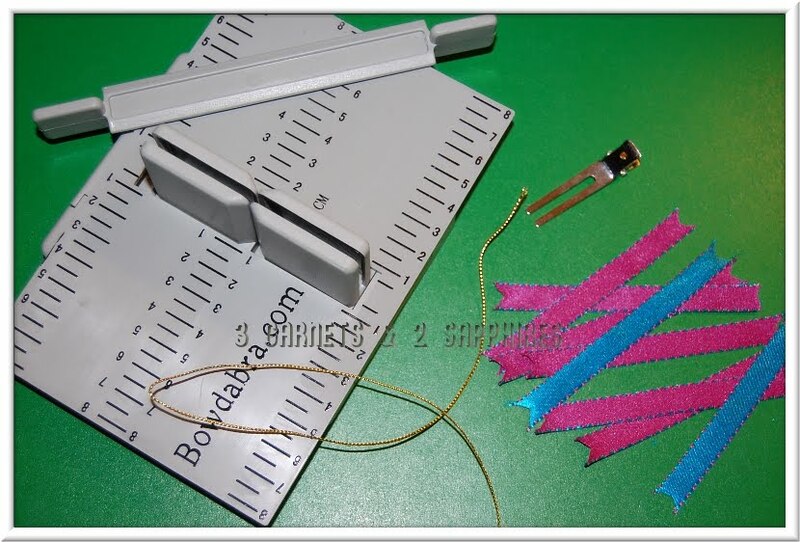 The project below combines all the techniques in the above two projects to create a headband. I only needed to insert a thin headband into the Mini Bowdabra on top of my folded bow wire. 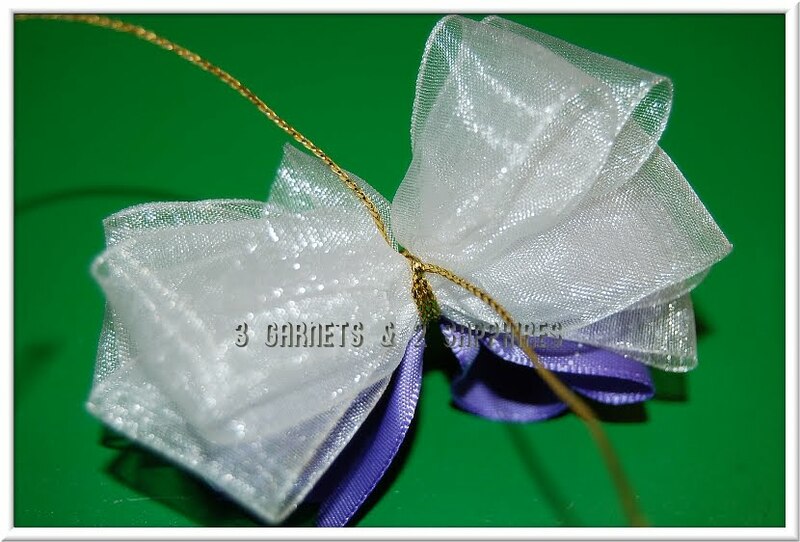 Tip #3: If you are using ribbon that has a repeating design on it, for best results, try to show the design evenly on both the left and right side of the bow. Thanks to the Mini Bowdabra, I think I did pretty well considering this was my first attempt ever at making hair bows. 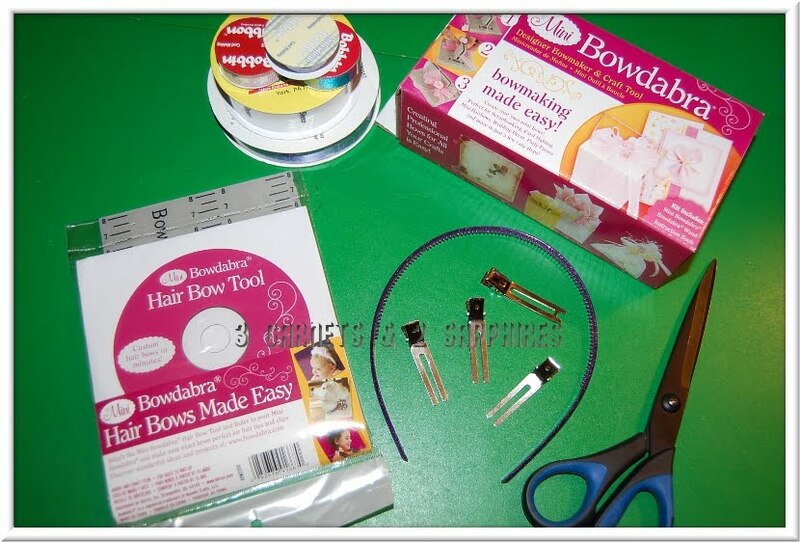 The Mini Bowdabra retails for just $14.99 and the Hair Bow Tool, which includes a CD on how to make 70 different bow projects, retails for just $12.99. 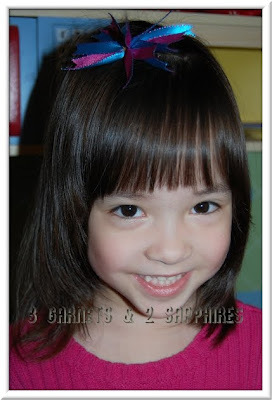 The price to buy 7 or 8 little hair bows would easily cost as much as both products put together. 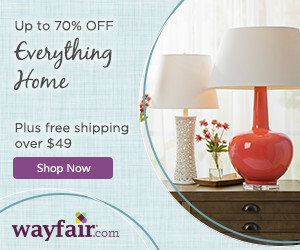 You can purchase these products and various bow-making supplies online at RibbonsAndThingsStore.com and locally at major craft stores, such as A.C. Moore, Jo-Ann Fabric and Craft Stores, Michael's, and even Wal-Mart. 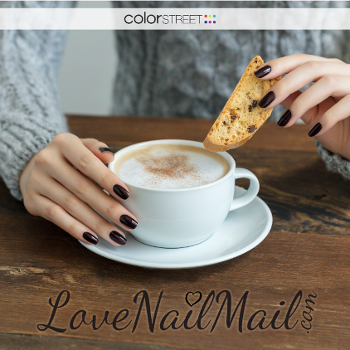 Thank you to Bowdabra for sending us complimentary product samples and supplies to utilize in this article.